When Marika Pruska-Carroll returned from a research trip to Russia in the summer of 1991, her students greeted her with hundreds of questions about Russia. They wanted to know the effect the transformation from a communist society to a free market system had on the lives of ordinary Russians. She asked her students to write down all the questions they would want to ask Russians, if they knew the language and were free to travel anywhere in the country. Armed with this list, Pruska-Carroll spent the next three summers travelling in Russia and talking to people. This is a revised and expanded edition of the popular original edition published in 1995. It includes revisions, a new preface, chapter [on Russian youth], and afterword. Russia's transformation from a Communist society to a free-market system is revealed through the eyes of ordinary Russians-young, old, urban, rural, workers, professionals, artists, businesspeople, soldiers, the Mafia, scientists, students, dropouts, and the unemployed. Captured in this book are the changes that Russia experienced as it entered a stage of radical transformation in the early 1990s, as well as the frustration that a new generation still feels ten years later. 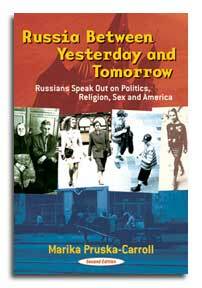 This new edition of Russia Between Yesterday and Tomorrow includes the concerns of Russia's youth, the effect of the Internet, and Russia's adaptation to the free-market economy. Marika Pruska-Carroll teaches Russian and Eastern European politics at Concordia University, Montreal. Marika Pruska-Carroll teaches Russian and Eastern European politics at Concordia University, Montreal.